What is Male Hormonal Acne? Teenagers aren't the only ones who get acne - it can can effect adult men of all ages. The average age of the acne sufferer in the US increased during the last decade from 20.5 to 26.5 years old. Acne is a manifestation of internal imbalance that leads to overproduction of sebum (skin oil) by sebaceous glands. This extra sebum together with dead cells and dirt creates an ideal condition for bacteria what in turn will cause an inflammation that presents itself as ACNE (pimples, cysts, blackheads, whiteheads etc). Hormones appear to be the primary culprit in adult male acne. The most potent stimulator of sebaceous glands are the male hormones known as androgens. While both women and men actually produce all three types of sexual hormones (testosterone, estrogen and progesterone), naturally, men "manufacture" much more testosterone, and therefore their cases of hormonal acne may be more severe, chronic and difficult to treat. Also, testosterone levels increase due to exercise, and since today more men are engaged in strenuous or even excessive workouts, acne became a more prevailing problem. Don't Struggle, Learn How to Treat It! Adult acne does not go away on its own. It needs to be treated. Yes, you can modify your lifestyle to a healthier way of life, but ultimately, if you want to really get your life back, choose an acne treatment that is proven to provide results that won't harm your skin further. an all botanical and clinically tested acne treatment, does. It is not only a no-mess, no-fuss natural medicine that can easily be used by guys on the go (just take it with your meals or snacks, and be on your way), but most importantly, it does not contain any phytoestrogens, (women-like hormones), does not directly affect your testosterone levels, and does not contain gluten, sugar or milk derivatives. 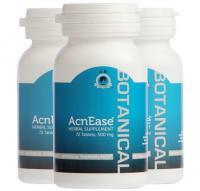 is tested for safety, and up to 80% effective in improving male hormonal acne. The unique all natural formula of AcnEase will not only help control existing acne, but will PREVENT new acne form coming (this is really the only way to treat acne breakouts). Test our FREE 3-step "Smart-System" to see which treatment will give you the best results! As the increase in androgens is the main reason why men get acne, there are some additional factors that may exasperate the acne symptoms for different people. Paying attention to them may help control acne outbreaks, and speed up the treatment process. Controlling these factors alone however is NOT sufficient to treat and PREVENT acne - as mentioned above, you must treat it to defeat it! Research suggests that increased insulin can cause inflammation in the skin, leading to breakouts. Casual observations also confirm that limiting simple carbohydrates, switching to a whole grain, low sugar diet and limiting processed foods that include sugar, can help to keep skin healthy. Good and bad fats can also play a role in helping guys to maintain clear skin. Fried food high in saturated fats are bad not only for your body, but also for your skin. Food rich in Omega-3's such as salmon, trout, sardines, avocado or nuts and EPA supplements can reduce the inflammation and therefore help to keep those pimples at bay. Researchers believe that stress hormones can worsen acne. Certain steroid hormones, like glucocorticoids and adrenal androgens, are released during stress, and are known to cause breakouts by activating the oil glands, therefore stimulating the sebum production that may start clogging the pores. There is preliminary data to suggest that several years of sun exposure may increase the skin's oil production (the skin tries to protect itself against over drying agents like salicylic acid, alcohol, peroxide, sun and wind). So if you live in a sunny climate, use non-comedogenic (non-pore clogging) sun protection and moisturizers. Please also note that using any type of anabolic performance enhancing products and/or testosterone boosters can lead to many problems, including severe acne. Try Our F REE 3-second "Smart-System" to see which treatment will give you the best results!